Researchers who studied the brains of deceased Alzheimer’s patients found that people who did not have diabetes had many of the same abnormalities in their brains as people who did. Specifically, people with Alzheimer’s who did not have diabetes had reduced levels of insulin in their brains. Furthermore, a different group of researchers examined a collection of studies and found the brain function of people with Alzheimer’s declined in their ability to metabolize glucose, which preceded or coincided with cognitive decline. As the insulin functioning in the brain worsens, researchers found the size and structure of the brain also declines. All of the above happenings also occur as Alzheimer’s disease progresses. But, it’s important to note that while Type 2 diabetes appears to contribute to and exacerbate the development of Alzheimer’s, it is not the sole cause of the disease. 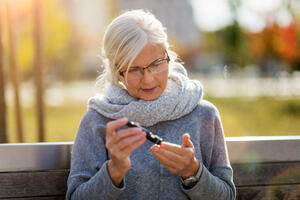 The important thing to keep in mind is that Type 2 diabetes can be prevented or reversed. By reducing your risk, you lower your chance of developing complications like stroke, heart disease and Alzheimer’s disease. Following your healthcare team’s recommendations for controlling your blood sugar, blood pressure and cholesterol. Eat a healthy diet that includes fruits, vegetables, whole grains and low-fat meats and dairy.